Very simple note on disk device "paths" in some common architectures. 1. A GENERIC (INCOMPLETE) OS MODEL. 2. THE DEVICE TREE & FIRMWARE pre-boot IMPLEMENTATIONS: Open firmware & UEFI. 3. MBR (BIOS), GPT (UEFI). 4. A VERY SHORT SECTION ON SOME SCSI TERMS. 5. WORLD WIDE NAME IDENTIFIERS. 6. BLOCK IO, FILE IO, AND PROTOCOLS. 7. JUST A FEW NOTES ON VMWARE. 8. JUST A FEW NOTES ON NETAPP. 9. JUST A FEW NOTES ABOUT STORAGE ON UNIX, LINUX AND WINDOWS. are generally in use in a common Operating System? Or, why exists WWPN's,and what exactly are they? a "device tree" and stuff, and indeed, how does nvram or firmware play a role in finding storage? some of the answers to those questions. you really have no other option than to "dive deep" into some protocol. In contrast, this note, keeps a very High-Level view at all times. Also, there is no special focus on any specific type of architecture. Chapter 1. A GENERIC (BUT INCOMPLETE) OS MODEL. have some relation to finding and accessing storage. Suppose a user application wants to open a file, which exists "somewhere" on "some sort of storage". filesystem, say, a directory somewhere in the "/home" filesystem. (sort of api), and the request will be passed on to the kernel. Please take a look at figure 1.
hand off the request to a specialized 'IO Manager' (which in fact is a very generalized concept). Since there are so many types of "filesystems", this module really uses a sort of "plug and play" concept. any specific module which can deal with a certain specific filesytem. the NTFS and JFS modules (since they are not of use here). Note that some number of those modules might thus already be loaded, ready for use. Fig 1. Simplified storage driver stack in a model OS. a clue of the true physical path. on a Fiber Channel (FC) SAN. If another type of storage needed to be accessed, like iSCSI, another specialized set of drivers was used. but this time of a real OS. Figure 2 shows you (very high-level !) how it is implemented in Windows. Fig 2. Simplified storage driver stack in Windows. Here too, we see a Virtual Filesystem (VFS), which can utilise specialised modules for a specific filesystem type. 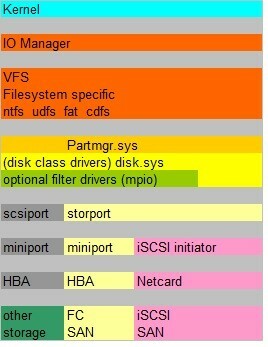 In figure 2, you can see the "ntfs", "fat" and other specialized modules. that their "identity" stays the same (like an F: drive stays the F: drive, also after a reboot). Next, "storport.sys" is a general acces module for any type of remote storage. and the lower level "miniport" drivers. It deals with many tasks like queueing, error messages etc..
for example a netcard (for iSCSI) or a HBA (for accessing a FC SAN). Chapter 2. The Device Tree & firmware pre-boot implementations. to booting a Host. Now, whatever Operating System follows after this "pre boot" is actually of no concern here. So, for practical purposes, view this chapter as a description of "bare metal machine" boot. In a later chapter, we will see more of a boot of a Hypervisor-like machine, which natively is meant to support VMs. It's interesting to see what "entity" actually discovers buses, and devices on those buses. But it severly depends on the architecture. the computer to find out "what's in there", and configure the system accordingly. Yes and No. I know that "yes and no" does not sound good, but it is the truth. Please be aware that I'am not saying that an OS does not have "polling/enummarator features". Certainly not. which enables the admin the view/walk the tree, map devices, probe for devices, and ofcourse, boot an OS. Ofcourse, in general terms, if you get a kernel (and the rest of an OS), it's meant for a certain architecture. We all understand that, say, just some Linux distro for Intel x86, will not run unmodified on other platforms. on all sorts of buses. devices? One solution might be: build a kernel with lots of tables or configuration databases. In an Open Industry, this was never perceived as a viable solution. like "Open firmware", ACPI and UEFI. Already quite early, some firmware-like solutions were implemented, like for example Openboot for Sun Sparc machines. Openboot might be considered to be an "early" Open firmware implementation. before the OS boots (like Solaris 8 in those days). autoboot (to Solaris) was true, and so forth. at the "Openboot" prompt, usually visible on the console as a "ok>" prompt. or even "probe" for newly installed devices. to build "friendly" names in "/dev" while the device tree was still visible (and mounted) in "/devices". uses that info further for configuration. non-proprietary boot firmware that might be implemented on various platforms or architectures. ⇒ For example, the CHRP Specification (Common Hardware Reference Platform) requires the use of Open Firmware. Examples are the Power- and PowerPC architectures of IBM. No doubt that "system p" and "system i" Admins, know of the "ok>" prompt which can be accessed through the SMS Boot Menu. These are the modern AIX and AS400 (old term) machines, capable of running AIX, I (AS400), and Linux VM's. ⇒ Also, you will not be surprised that Sun machines uses an Open firmware implmentation too. (Sun has been "eaten" by Oracle). ⇒ In contrast, as you probably know, Intel based x86/64 machines usually used to use PC BIOS implementations. However, implementing ACPI is quite established, and on newer Intel/Windows Platforms, EFI can be used as well. More about that later on. "minikernel" (so to speak) from firmware has booted, it can offer a shell with a limited commandset. which Openfirmware can use to build the device tree. and driver binding on devices. EFI, or the "Extensible Firmware Interface", was Intel's idea on replacing the traditional PC BIOS systems. to decribe this "new" BIOS-like followup protocol. using more and more extensions, kept up with new hardware implementations. However, it was time for a fundamental change. control on the bootprocess (and maybe many more), probably all led to the UEFI implementation. That is no to say that UEFI is "great". No, actually it's very complex, but at least it overcomes many limitations. partitioning scheme. However, in principle, you can use GPT without EFI, if it isn't a bootdisk. , but EFI, seen as a bootmanager, allows you easily to boot to another OS like RedHat, Suse, Windows, etc..
are possible, as described in the "EFI pre-boot authentication protocol". As a sidenote: It's also, for example, quite interesting to read articles on the Windows 8 "Early Launch Anti-Malware" implementation. In one sentence: EFI is often defined as an interface between an operating system and platform firmware. where at the last stage, UEFI code is called. So, each architecture uses it's own very specific initial routines. might be configured for "autoboot"to some OS. Or possibly enter the EFI "Shell". From this point on, it gets interesting for us. Take a look please, at figure 3. Fig 3. Simplified EFI boot sequence (on HP Itanium). depends also a bit per manufacturer, I am afraid. However, something called the EFI System partition (ESP) really is part of the EFI specs. Note the existence of the EFI System partition in figure 3. Figure 3 tries to show the Itanium implementation, as is often used by HP. This system partition, is indeed just a partition (likely to be on disk0) and it's of a FAT filesystem type. Do you notice the "\EFI" main directory, and the subdirectories like for example "\EFI\Redhat"? Each such subdir contains a specific "OS loader" for that specific OS. The actual kernel of an OS, will reside on another partition, possibly a partition on another disksystem. This explains why here on Itanium, multiboot is possible. By the way, the already mentioned "bootmenu"
is very easy to use, and here you can also specify to which OS the system should autoboot. kernel versions can be choosen to boot from. Operating systems may reside. For booting to RedHat, the OS Loader directory is "/boot/efi/EFI/redhat/". This directory contains "grub.efi", which is a special GRUB compiled for the EFI firmware architecture. If "autoboot" specifies this loader, then the system will boot to RedHat. This example is quite similar to example 1, but there are some minor differences per Manufacturer. This section was indeed a very lightweight discussion on the UEFI implementation. But it will help us later on. "everything in one Bang" so I leave GPT for Chapter 3. 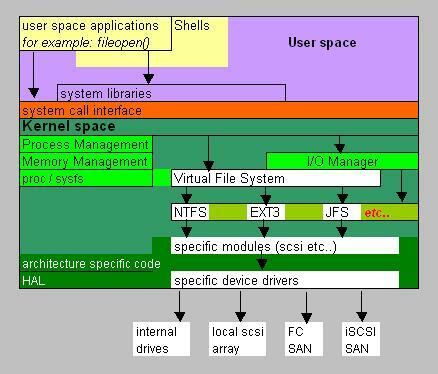 As we have seen, in many systems, the Kernel is "helped" by configuring the system, using a Device Tree. This might be the case in Open Firmware, UEFI systems, and a few others. just a pre-stored file or blob is passed to the kernel when it boots. for new devices, which usually are new local disks or new LUNs from a SAN. Some notes about that can be found in chapter 6. Chapter 3. MBR & GPT. that are used by typical OS'ses on that platform, like Linux, VMWare, Windows and others. called "GPT" as a follow up of the traditional MBR. We did not discusses GPT there, because it more or less focused on firmware and Device Trees. Now, it is also time to discuss stuff like MBR and GPT. out there, using BIOS, instead of Open Firmware or UEFI. rather quickly replaced by "Logical Block Addressing" (LBA), which uses a simple numbering scheme (0,1,2 etc..) of disksectors. BIOS int 13 and Enhanced BIOS implementations. onboard logic of the Controller. which explains why various partition size limits existed in the past, like the infamous 512M, 2G, 8G, 137G limits. However, that's much too "lengthy" so I skip that here (it's also not very relevant). (1). Disk manufacturers already have (or want) to go from a fundamental sector size of 512 bytes to 4096 bytes. (2). The Traditional MBR (Master Boot Record) of a disk is 512 bytes in size. 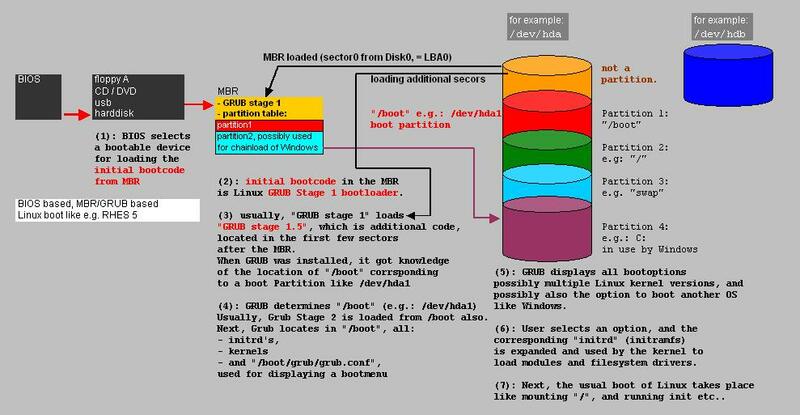 The MBR is located in Sector 0.
from another often used OS on Intel, like Linux, but a description of a MBR based Linux boot via a stage 1 "grub"
installed in the MBR, It think, is not very "opportunistic" at this point, so I will just discuss an MBR based Windows boot. has a length of 446 bytes. It's followed by the 64 byte "Partition Table", which supports 4 "partition entries" of each 16 bytes. One partition could be marked "active", and this then was a bootable partition containing the Windows OS bootloader. The initial bootcode of the MBR gets loaded, and reads the partition table. The active partition was found, and execution was transferred to the OS loader in that partition (like NTLDR). This OS loader then initiates the boot of Windows. Fig.4: Schema of the MBR. Purpose: 2 byte closing "Boot record signature"
Fig.5: Schema of a Partition Entry in the MBR. this amounts to about 4294967295 x 512=2.199.023.255.040 bytes, or a maximum partition size of 2.2 TB. are possible, and this partition size limit, these limits are, for today's standards, considered to be too small. with GPT, which is also a UEFI spec? It seems complicated, but its really not ! then you get GPT with a "EFI System Partition". consequence that you can use a GPT disk even with a BIOS based system, although with certain restrictions. So, UEFI is actually not required for using a GPT disk. This will be explained better in the next section. but later versions are switched to GPT. and showing if they can use GPT. 3.2 The GUID Partition Table (GPT). how it was used in the bootsequence, and the limitations posed by the MBR and Partition Entries. Contrary to the simple and small MBR (of 512 bytes long), the GPT is a completely different thing. An system with UEFI firmware, will natively use GPT based disks, and can boot from a GPT disk. An (older) BIOS based system, can use GPT based disks as data disks, but cannot boot from a GPT disk. Most newer releases of popular (Intel based) OS'ses, transfer to using UEFI and GPT disks (or already UEFI based). for several reasons, like protection from older tools like "fdisk" or legacy programs and utilities. leaving LBA 34 is the first usable sector for a true Partition. So, as from LBA 34, we can have a number of true partitions, that is, usable diskspace like C:, D: etc.. But the "end" of the disk is special again! It's a copy of the GPT, which can be used for recovery purposes. Just as we did in figure 4 for the MBR, let's take a look at a schematic representation of the GPT. for example in the old MBR scheme, it that case we can then say that the MBR was in "LBA 0". 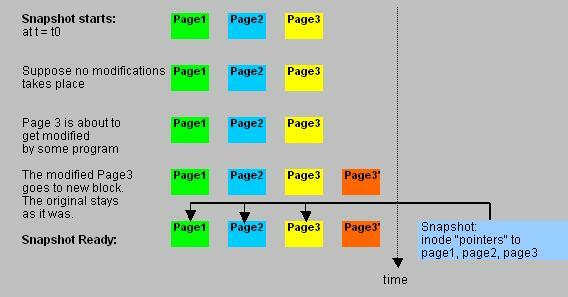 Fig.6: Simplified Schema of the GUID Partition Table. LBA 2 Partition Table starts. specified in the original specifications. If you take the numbers like in the above table, like 128 byte sized Partition Entries, and "room"
for 5 up to 128 Partition Entries, only then you will end up in LBA 34 as a startpoint for usable data. In GPT, in a Partition Entry, the "partition size field" (in no of sectors/LBA's), is now 64 bits wide. This amounts to a max partition size of about 9.4 ZetaBytes (about 9.4 billion Tera Bytes), which is quite large indeed. You can easily do that math yourself (if needed, take a look at the math in section 3.1). since both describes the structure of the disk (like "where" is "which" partition on "what" location etc..). Remember the UEFI System Partition (ESP) as described in section 2.3? On a "native" UEFI system, it will be automatically created as one partition on the first disk. So, it will usually be the first partition in the "orange area" as depicted in figure 6.
since it only needs to store the uefi metadata and OS bootloaders (see also figure 3). like "fdisk" and the like. For example, on recent versions of Linux, the traditional "fdisk" tool is replaced by utilities like "parted". 3.3 Some figures illustrating a BIOS/MBR boot, and an UEFI/GPT boot. Fig 7. Simplified example of a BIOS/MBR initiated boot of an "older" Windows system like Win2K3. In fig 7, we see an "old-fashioned style" boot of a once popular OS like XP, Win2K3 etc..
What we see here, is the stuff we have talked about before. -The BIOS selects a bootable device. Maybe it tries the DVD first, before going to harddisk0. -Then, it loads the "initial bootcode" from the MBR, which will access the "partition table". -Then it determines the specs from the "active" or "bootable partition" (for example, where it starts). This partition could be, for example, partition No 1. -Control is then passed to the OS loader on that partition (in this example, "NTLDR"). For example, such an arc path could point to partition No 2 (or to for example partition No 1 on another disk). -From then, the bootsequence of that OS really starts. Now you may say: "this is Windows !" So how about another OS that also initially starts from BIOS/MBR, like Linux RHEL 5 or so? Ok, the following figure it not so terribly different from fig 7, but I like to show it here anyway. Fig 8. Simplified example of a BIOS/MBR initiated boot of an "older" Linux system like RHEL5. This note is not for discussing bootsequences in detail. However, the overall sequence of events is visible in figure 8. Ofcourse, the start of the Linux OS as such, is depicted to happed as of Step 7 in figure 8. At this point, those phases are not so of interest, so that's why it was not detailed further. a bit more on the role of GPT, and the UEFI System Partition. Here, I will only show that picture. If you need more info on UEFI itself, you might check section 2.3. Fig 9. Simplified example of a UEFI/GPT initiated boot. Ok, I myself would certainly not give an "A rating" to the figure above, but it should help "somewhat" in understanding UEFI boots. The firmware boot, is decscribed in section 2.3. At a certain moment, the UEFI bootmanager reeds the GPT. Since the GPT is "metadata", mainly about true partitions, partitions can be indentified by there Globally Unique Id, the GUID. which should be like C12A7328-F81F-11D2-BA4B-00A0C93EC93B. Once found, UEFI can locate the correct OS loader, in case autoboot is in effect. Contary to the "native" MBR situation as shown in section 3.3.1, UEFI does NOT load "initial bootcode" from GPT. So, in this phase, no sort of bootsecor with code, is loaded. Only meta data is read. The preboot is fully containted in UEFI itself. expects GUID Partition Table metadata (GPT). Indeed, GPT is part of the UEFI specifications. However, manufacturers sometimes find smart ways (or maybe not so smart ways) to implement sort of hybrid forms. it actually is possible to have a system with an ESP, using the "old MBR style" metadata. In this case, in a Partition Entry in the MBR, the ESP can be indentified by it's ID of value "0xEF". of booting from GPT disks. We already have seen the limitations of the MBR. GPT based disks are becoming more and more the standard on Intel systems. Traditional BIOS systems use MBR bootcode and MBR partitioning metadata. Native UEFI machines (newer x64 and Itanium) use GPT as partitioning metadata. The only preboot code is from UEFI. Traditional BIOS systems using MBR, can (easily) use GPT disks as data disks. And.. indeed it's possible to use MBR and a EFI System Partition. Chapter 4. A VERY SHORT SECTION ON SOME SCSI TERMS. This very short section, will just focus on few concepts related to SCSI, namely addressing and paths. Undoubtly, with any OS using SCSI, you will encounter addressing paths like for example "[1:0:1:0]". But what is it? It's really extremely simple. and lastly (and optionally) which LUN do we want to address? Sure, the SCSI protocol (and bus) has it's complexities, but for this note we can keep it really that simple. Don't forget that it is just a set of rules and commands. In other words: it's a protocol. So, definitions were described too, on how to address devices (targets) and sub-devices (LUNs) on the bus. That's all. Fig. 10. SCSI controller with bus, targets. The figure above illustrates an old-fashioned "SCSI card", or also called "SCSI controller". However, with respect to addressing of storage, the most common "name" for such a card is "HBA" (Host Bus Adapter). a true physical SCSI bus, to for example a fiber based FC LAN, which connects your system to SCSI disks. drwxr-xr-x 9 root root 0 Sep 21 14:59 .
drwxr-xr-x 39 root root 0 Sep 21 14:59 .. Note the string in "bold" which is again a SCSI address, as a part of a full "hardware path". like "1:0:2:0" as in example 1, or denoted slightly otherwise like for example "adaptername0:C0:T0:L0" as in example2. Note: in many SANs the "T" might refer to the "zoning target/number", but the idea stays quite te same. This then represents the address of a LUN (or "disk") from a FC or iSCSI SAN. the first bus is "bus0" etc... Also, LUNs start numbering as of "0". that might be the "end device" itself: it does not have any subdevices "inside". Don't forget that there exists many sorts of devices which can be placed on a SCSI bus. However, in Storage, the target often is a complex device which manages many subdevices. In such a case, we do have subdevices that needs an subaddress too (the LUN numbers). This is more or less how the situation often is, in addressing LUNs from a SAN. You might have found one target#, with one or multiple LUNs "below" it. those commands are just simply encapsulated in a network packet as in iSCSI: the principle stays quite the same. On a SCSI bus, like shown in figure 10, a path like for example [0:0:1:1], uniquely identifies an object on that Bus. to Storage controllers. In this situation, we cannot uniquely identify for example a HBA on a Host. If you have multiple Hosts, all with a HBA called "host0", you cannot uniquely identify communication partners. That's why extended addressing have been applied in SANs, using socalled "WWPN addresses". Chapter 5. "World Wide" Identifiers. of local targets using a traditional SCSI bus (or channel). Just like in figure 10.
be uniquely addressed (and identified). In such a case, ServerA has a HBA called "host0", but the same is true for any other Server like Server B. So, ServerB might have a HBA called "host0" too. between the different HBA's on the different Servers, and all other devices like the switch ports involved, the SAN ports involved etc..
any Host is supposed to have a unique IP address just to make sure that the "sender" and the "receipient" of data are uniquely defined. only names like "host0" is used. Questions like "which host0 (hba) on which Server" would arise immediately. That's why globally unique "World Wide" ID's were introduced. the same idea have been applied in FC SAN networks. A WWPN is sort of the "MAC equivalent" in a SAN network. It's a 8 byte identifier. or with a ":" between each byte (two digits), like "21:35:39:00:f0:27:67:69". Some organization has to keep an "eye" on the possible WWPNs, in order to warrant uniqueness. This is the IEEE. will be part of the WWPNs in all their products. This OUI is then unique per Manufacturer. There is a certain structure in any WWPN. A WWPN is derived from it's parent WWNN (of the device). On Linux, people often use the "QLogic" adapters (qla drivers) or "Emulex" adapters (lpfc driver). Where adapter_type is the host adapter type and n is the host adapter number for your card. or in "/sys/class/fc_host". In the latter, you then probably find an entry called "port_name". Again, it depends a bit of which driver and FC Card you use. Maybe, with your Card, some utilty was provided too. multiple Hosts are connected (through one or more switches) to a SAN controller. view of such a SAN. Fig. 12. Sketch of Hosts to FC SAN connections, and NAS network communication. Chapter 6. BLOCK IO, FILE IO, AND PROTOCOLS. Local disks or local (SCSI) disk arrays, work at the block I/O layer, below the file system layer. and are also accessed by block IO services. Contrary, unix-like NFS network mounts, or Microsoft SMB/CIFS shares, operate on the network layer. File IO commands will see to it that the client OS gets access to the data on those shares. HBA Fiber cards, which connects to one or more switch(es), which is then further connected to the Storage arrays. people talk about "block I/O services" when discussing (traditional) SAN's. The same is true in iSCSI, where transfer of block data to hosts occurs, using the SCSI protocol over TCP/IP. In a network, there might exists "fileshares" exposed by file/print servers (Microsoft), or NFS Servers (Unix/Linux). Here, your redirector client software, "thinks" in terms of "files" that it want to retreive or store to/from the Server. that data segments are enveloped by more or less regular network packets, like in any other normal TCPIP network. Since client and Server think in terms of whole files, people speak of File IO Services. Two main Redirector/Server protocols are often used: CIFS (the well-known SMB from Microsoft) and NFS (Unix/Linux world). A NAS device actually has all features of a regular FileServer. So, it's often used as a CIFS and/or NFS based Server. It has some features like a SAN, since a true NAS device is also a device with a controller and Diskarray(s), thus resembling a SAN. Obviously, a NAS devices has network ports which connects it to networkdevices (like a switch). However NAS comes in a wide variety of forms and shapes. on the right side shows a NAS device that's placed in a "regular" network. Many modern controllers (or filers) have options for FC SAN, and iSCSI SAN implementations. Obviously FC uses primarily FC cards and FC connectors. However, iSCSI just uses network controllers. And, modern filers have options to expose the device as a NAS (CIFS and/or NFS Server) on the network as well. Some folks used to say: "if it is an Block I/O then it is SAN, if it is an File I/O then it is an NAS"
Nowadays, this is still true, but as we saw above, modern SANs have options to expose it (partly) as a NAS too. FC-SAN or Fibre Channel Protocol (FCP), usually using a switched Fiber infrastructure, can be seen as a mapping of SCSI over Fibre Channel. iSCSI SAN, using a network infrastructure, can be seen as a mapping of SCSI over a TCPIP network. Fibre Channel over Ethernet (FCoE). This is the FCP protocol using network technology. In Europe, especially FC-SANs and iSCSI SANs are popular, while recently a renewed interest seems to exists in FCoE SANs. like for example "FICON" in IBM mainframe storage technologies. However, it's not alway called a "SAN". "NAS" devices, and FileServers, primarily expose "shares" (like Microsoft SMB/CIFS, or NFS on Unix/Linux), where "File IO"
is implemented. So, the "unit" that ultimately gets transferred (using network packets), is a file. it were a local disk (which it's not ofcourse). or creating the "/data" filesystem on a Unix/Linux system. it does not create some sort of preferred filesystem on that NAS based storage. and only Oracle ASM IO services has formatted it to it's proprierty layout, and only ASM "knows" the details on how to access the data on that LUN. Chapter 7. A FEW NOTES ON VMWARE. A VMWare ESX / ESXi host, which is a "bare metal" or "physical" machine, is the "home" for a number of "Virtual Machines" (VMs). There are quite some differences between ESX 3.x, and ESXi 4/5, also with respect to storage implementations. Along all versions, the following "red line" can be discovered. You know that an ESX(i) Host, essentially runs Virtual Machines (like most notably Windows Servers, Linux Servers). These VMs have one or more "disks", just like their "bare metal" cousins. typically could have a size of 20GB or so. on a NFS filesystem. This NFS storage can be "exposed" by a NAS, or a SAN acting as NAS, or other NFS Server. However, the datastore could also be found on LUNs from a FC SAN or iSCSI SAN. So, a VM uses one or more "common disks", which are just .vmdk files, for example stored on NFS. For a Windows VM, such a disk is the local systemdrive C:, and possible other drives like D:, all stored in their .vmdk files. and nowadays also often on iSCSI SANs too. in clustered solutions, where for example the SQL Server database files reside on. So, a common scenario in VMWare was, that the "system drives" of the VMs were stored as .vmdk files in some datastore. (shared) storage of SQL Server database files, and other shared resources needed for the cluster. This is still a very common scenario, but in the latest versions, different scenario's are possible too. Although a VMWare host can connect to various SAN vendors, it's just a fact that "NetApp" SANs are very popular. Fig. 13. Traditional VMWare hosts and NetApp storage solution. can represent their local system disk (like C: on a Windows VM). Only the second VM (VM2) uses LUNs from a SAN. In this example, it's a Netapp SAN. but iSCSI and various forms of NFS/NAS implementations have gained popularity too. A said before, VM's uses ".vmdk" files for their systemdisk, and optionally other disks. Ofcourse, such a VM might additionally also use a LUN from an FC SAN, or iSCSI SAN, or other LUN provider. Let's first see how the VM's systemdisks (their .vmdk file and other files) are organized. Note: The sample commands below, are just part of a full procedure, and cannot be used isolated. They are listed for illustrational purposes only. VMWare uses the concept of "datastore", which can be viewd as a "storage container" for files. The datastore could be on a local Host hard drive, on NFS, or (nowadays) even on a FC or iSCSI SAN. "Inside" the datastore, you will find the virtual machines .vmdk files and other files (like a .vmx configfile). Here, our aim is to find out which files makes up a VM's systemdisk. But, let's first create a datastore. You can use graphical tools to create a new datastore (like vSphere client), or you can use a commandline. In VMWare, using graphical tools while connected to a central Management Server, is the best way to go. Now, lets suppose that we already have created several VM's. How does the VM files "look like"? Here too, as a preliminary, it is important that the VM's were properly registered in the repository of "vCenter" (or "VirtualCenter"). Again, using the vSphere client, those actions are really easy and it makes sure the VM's are properly registered. Here, just "browse" the correct datastore, locate the correct .vmx file, and choose "register". Very easy indeed. You might say that the VM "exists", when it was shutdown, solely of the files located in the datastore. The files can be found in the VM's "homedirectory". Actually, there are a number of files, with different extensions, and different purposes. Fig.12: Some files that make up a VM in VMWare. vm1.nvram The "firmware" or "BIOS" as presented to the VM by the Host. like amount of RAM, nic info, disk info etc..
vm1-flat.vmdk The full content of the VM's "harddisk". vm1.vswp Swapfile associated with this VM. -rdm.vmdk If the VM uses SAN LUNs, this is a proxy .vmdk for a RAW Lun. .log files Various log files exists for VM activity records, usable for troubleshooting. The current one is called vmware.log, and a number of former log files are retained. This list is far from complete, but it's enough for getting an idea about how it's organized. Chapter 8. A FEW NOTES ON NETAPP. NetApp is the name of a company, delivering a range of small to large popular SAN solutions. the product is very wide, and technically complex. To implement an optimal configured SAN, is a real challenge. So, this chapter does not even scratch the surface, I am afraid. However, to get a high-level impression, it should be OK.
A controller, called the "Filer" or "FAS" (NetApp Fabric-Attached Storage), functions as the managing device for the SAN. The Filer runs the "Ontap" Operating System, a unix-like system, which has it's root in FreeBSD. The Filer manages "diskarrys" which are also called "shelves". same CL and tools, and methodology. Many features in NetApp/Ontap must be seperately licensed, and the list of features is very impressive. and much more other stuff, not mentioned here. But we will discuss Snapshot backup Technology in section 8.4.
resulting in "a sort of" Filesystem with "very" extended LVM capabilities. Fig. 14. SAN: Very simplified view on connection of the NetApp Filer (controller) to diskshelves. In the "sketch" above, we see a simplified model of a NetApp SAN. Here, the socalled "Filer", or the "controller" (or "FAS"), is connected to two disk shelves (disk arrays). Most SANs, like NetApp, supports FCP disks, SAS disks, and (slower) SATA disks. Since quite some time, NetApp favoures to put SAS disks in their shelves. to multiple diskshelves. This would then be a HA solution using a "Failover" methodology. the ownership of its shelves would go to the netapp2 filer. 8.2 A conceptual view on NetApp Storage. Note from figure 14, that if a shelve is on port "0a", the Ontap software identifies individual disks by the portnumber and the disk's SCSI ID, like for example "0a.10", "0a.11", "0a.12" etc.. This sort of identifiers are used in many Ontap prompt (CL) commands. Fig. 15. NetApp's organization of Storage. which is the most robust option ofcourse. It's possible to have one or more Raid Groups. An "Aggregate" is a logical entity, composed of one or more Raid Groups. Once created, it fundamentally represents the storage unit. when creating a certain aggregate. - if you would create a 16 disk aggregate, you would end up with one RG. - if you would create a 32 disk aggregate, you would end up with two RG's. become available later? Can you then still expand the aggregate? What is the ratio of usable space compared to what gets reserved? You see? When architecting these structures, you need a lot of detailed knowledge and do a large amount of planning. LUNs (for FC or iSCSI), or CIFS/NFS shares. From a FlexVol, CIFS/NFS shares or LUNs are created. A LUN is a logical representation of storage. As we have seen before, it "just looks" like a hard disk to the client. From a NetApp perspective, it looks like a file inside a volume. The true physical implementation of a LUN on the aggregate, is that it is a "stripe" over N physical disks in RAID DP. Why would you choose CIFS/NFS or (FC/iSCSI) LUNs? Depends on the application. If you need a large share, then the answer is obvious. Also, some Hosts really need storage that acts like a local disk, and where SCSI reservations can be placed on (as in clustering). In this case, you obviously need to create a LUN. Since, using NetApp tools, LUNs are sometimes represented (or showed) as "files", the entity "qtree" gets meaning too. It's analogous to a folder/subdirectory. So, it's possible to "associate" LUNs with a qtree. objects associated to that qtree. 8.3 A note on tools. There are a few very important GUI or Webbased tools for a Storage Admin, for configuring and monitoring their Filers and Storage. Once "FilerView" (depreciated on Ontap 8) was great, and followup versions like "OnCommand System Manager" are probably indispensable too. These type of GUI tools allow for monitoring, and creating/modifying all entities as discussed in section 8.2. It's also possible to setup a "ssh" session through a network to the Filer, and it also has a serial "console" port for direct communication. There is a very strong "command line" (CL) available too, which has a respectable "learning curve". Even if you have a very strong background in IT, nothing in handling a SAN of a specific Vendor is "easy". Since, if a SAN is in full production, almost all vital data of your Organization is centered on the SAN, you cannot afford any mistakes. To be carefull and not taking any risks, is a good quality. There are hundreds of commands. Some are "pure" unix shell-like, like "df" and many others. But most are specific to Ontap like "aggr create"
and many others to create and modify the entities as discussed in section 8.2. 8.4 A note on SNAPSHOT Backup Technology. One attractive feature of NetApps storage, is the range of SNAP technologies, like the usage of SNAPSHOT backups. You can't talk about NetApp, and not dealing with this one. or LUNs might be created (accesible via FCP/iSCSI). Now, we know that NetApp uses the WAFL "filesystem", and it has its own "overhead", which will diminish your total usable space. This overhead is estimated to be about 10% per disk (not reclaimable). It's partly used for WAFL metadata. Apart from "overhead", several additional "reservations"are in effect. When an aggregate is created, per default "reserved space" is defined to hold optional future "snapshot" copies. not to set it too low. As a guideline (and default), often a value of 5% is "postulated". Next, it's possible to create a "snapshot reserve" for a FlexVol too. reserve of 20% should be applied. However, numbers seem to vary somewhat when reading various recommendations. However, there is a big difference in NAS and SAN LUN based Volumes. There are few different "Snapshot" technologies around. One popular implementation uses the "Copy On Write" technology, which is fully block based or page based. NetApp does not use that. In fact, NetApp uses "a new block write", on any change, and then sort of cleverly "remebers" inode pointers. To understand this, lets review "Copy On Write" first, and then return to NetApp Snapshots. Fig. 16. "Copy on Write" Snapshot (not used by NetApp). Let's say we have a NAS volume, where a number of diskblocks are involved. "Copy on Write" is really easy to understand. Just before any block gets modified, the original block gets copied to a reserved space area. the block with the new data. In effect, you have a backup of the entity (the Volume, the file, the "whatever") as it was at t=t0. (saved) blocks "over" the modified blocks. were modified between t=t1 - t=t0. of diskspace compared to a traditional "full" copy of blocks. You can schedule a Snapshot backup of a Volume, or you can make one interactively using an Ontap command or GUI tool. So, a Netapp Snapshot backup is not an "ongoing process". You start it (or it is scheduled), then it runs until it is done. The mechanics of a snapshot backup are pretty "unusual", but it sure is fast. Fig. 17. NetApp Snapshot copy. It's better to speak of a "Snapshot copy", than of a "Snapshot backup", but most of us do not care too much about that. It's an exact state of the Volume as it was at t=t0, when it started. is going to be modified while the backup runs, WAFL just takes a new free block, and puts the modified block there. The original block stays the same, and the inode (pointer) to that block is part of the Snapshot ! So, there is only one write (that to the new block). The inode (a pointer) of the original block is part of the Snapshot. It explains why snapshots are so incredably fast. From Ontap's perspective, there is no problem at all. However, many programs run on Hosts (Servers) and not on the Filer ofcourse. So, applications like Oracle, SQL Server etc.. have a completely different perspective. The Snapshot copy might thus be inconsistent. This is not caused by Netapp. Netapp only produced a state image of pointers at t=t0. And that is actually a good backup. The potential problem is this: NetApp created the snapshot at t0, during the t0 to t=t1 interval. In that interval, a database file is fractioned, meaning that processes might have updated records in the databasefiles. as "consistent". If that's not done, the database is "inconsistent" (so the database engine thinks). By the way, it's not databases alone that behave in that manner. Also all sorts of workflow, messaging, queuing programs etc.. Although the Snapshot copy is, from a filesystem view, perfectly consistent, Server programs might think differently. That thus poses a problem. Netapp fixed that, by letting you install additional programs on any sort of Database Server. These are "SnapDrive" and "SnapManager for xyz" (like SnapManager for SQL Server). In effect, just before the Snapshot starts, the SnapManager asks the Database to checkpoint and to "shut up" for a short while (freeze as it were). SnapDrive will do the same for any other open filesystem processes. The result is good consistent backups at all times. Chapter 9. A FEW NOTES ABOUT STORAGE ON UNIX, LINUX, and WINDOWS. After a few words on storage in general and SAN's, let's take a look to how storage is viewed, used, and managed from some client Operating Systems. Since this information really can be seen as a "independent" chapter, I have put this in a seperate file. It can be used as a fully independent document. Some notes on Storage and LVM in Unix systems.